I have been away for a while…a long while, actually. A combination of a move and a vacation and a nasty cold have made me extremely delinquent in my writing here. But this week, at least, I have found some time. My topic this week is healing. Of all Christ did, the most plentiful of his miracles were those involving healing the sick and afflicted. And even today, it is healing that people seem to associate most directly with miracles from God. And even those not of our faith who understand the mission of Christ differently than we do understand and remember these great miracles. So clearly, healing is an aspect of Christ’s character and ministry that fascinates and intrigues all. So without further introduction, let’s jump in! The topic of healing is big, broad, and impossible to cover in a forum such as this. So of course, this will not be a complete discourse. Rather, this will be a collection of several of what I consider the most important aspects of the topic. At their most basic, miracles of healing involve the cure or alleviation of some physical malady. In Christ’s day, he healed lameness, blindness, issues of blood, palsy, leprosy, and other common illnesses. At that time, medicine did not understand how these maladies occurred, and divine intervention was in most cases the only remedy for one so afflicted. One interesting story of a physical healing is found in Mark chapter 2. The story will be familiar to all. Jesus had set off quite a furor in Israel of that day, and many people were coming to see, hear, and be healed by him. Among these people was a man with a palsy. The scene sees Jesus at someone’s house delivering a sermon. Many people had come to hear this revolutionary new teaching. Now remember that not many people in the Old World actually recognized Jesus as their Messiah. As we know, they were expecting a physical, temporal ruler. Many others clung to Jesus for the fact that he obviously had the power to heal maladies that were beyond the medical knowlege of the time. Of course, many others came to hear spiritual teachings, aquaiting Jesus with the prophets of the old testament. But this man the man with the palsy, came for a different reason. The building was crowded, and there was no way for him to get in. Something about his malady prevented him from walking, and his friends carried him on a bed. But notice the way the story plays out. The man could certainly have waited outside and been healed by Jesus. There are many opportunities of people being healed by the wayside. But some sense of urgency attends the scene. I do not know the nature of this man’s malady, and I do not know who it was that thought of the idea, but one of these 5 people (the man and his 4 friends) decides to break open the roof of the building and lower this man down. And here is where the subtle difference of this healing is seen. The scripture says “When Jesus saw their faith, he said unto the sick of the palsy, Son, thy sins be forgiven thee.” (Mark 2:5). Let us look at this verse closely. First of all, let us notice what it is that Jesus notices. it is not the diligence of these 5 men, but their faith. Without ever having seen or spoken to Jesus, they are willing to vandalize someone’s house and go to great length to get this man to Jesus. It was very possible that Jesus would refuse to see them and all their efforts would be for nought. Also, look at whose faith it is that Jesus notices. it’s not the faith of the man with the palsy, but the faith of all 5. It is not the one single man here who recognizes the Savior, and I think this is a point we often overlook. It is the faith of a collective of the 4 men who carry their friend along with the faith of the sick man that results in this singular miracle. Certainly, it was the 4 friends who took all the risk here. No one would blame the man with the palsy for the destructive breaking and entering that occrred. But these 4 men saw something urgent here, some need to carry this sick man to the presence of the Lord. In fact, there is no evidence that the sick man himself wanted to come to Christ or even believed in him. The “their” in this verse could legitimately mean the faith of the men who brought him. But there is a lesson here. Sometimes we are not strong enough alone to make it to the Savior. Sometimes, the “press” keeps us out; there are too many people, it’s too crowded. Sometimes the “crowds” keep us away by dragging us down. Sometimes fear of the world, fear of society…many other things keep us distant from the Savior. Sometimes these excuses are legitimate (as here). But whatever the reason, we are kept away from the salvation and blessings that await us at the feet of our Lord. And this is where the lesson is to be found. It is the man’s friends who help him overcome this. They too have faith…they too have a desire to be uplifted…they too recognize Christ. As with them, so with us…when our friends have strong testimonies, they can help us overcome our excuses. Alone it’s easy to fall, but strengthened, as was this man, by many faithful friends, we have the ability to break through barriers and overcome ourselves and our infirmities (and even our schedules) and fight our way to the presence of Jesus. Ultimately, a physical healing occurred here. 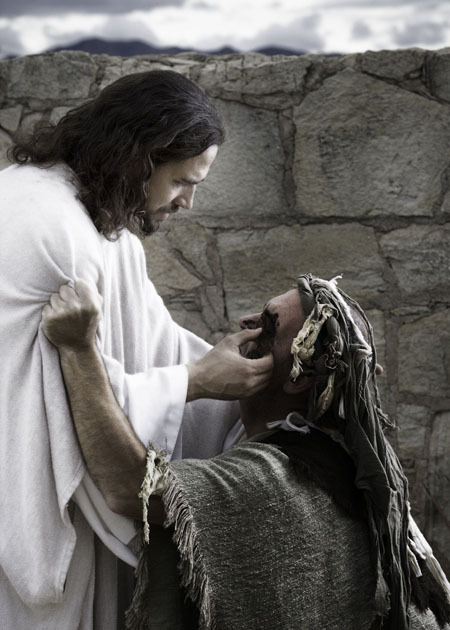 It was a blessing the sick man could find only at the hands of the Savior. Yet today, in many cases, doctors and scientists understand how healing works, at least to some degree. Yet the fact that we may understand better today how healing happens does not lessen the miraculous nature of the event. And even in the modern age, there is much we do not know. For example, while science has come far in understanding how diseases spread and how they can be neutralized, we understand very little about diseases of the mind. Depression, anxiety, bipolar disorder, addictions, and other serious mental ailments are still a mystery. And while they can be controlled at times with medication, all our science and knowledge is rarely enough to eradicate them. Yet fortunately, the Savior of the wold stands ready to aid us. The same power that once cured incurable diseases in Israel can cure them today as well. As the scripture says, “come unto Christ and be perfected in him.” (Moroni 10:32). As with the man with the palsy, if you are too weak to do it alone, lean on those around you. Your family and friends are a support network. Find someone who loves you enough to break down walls to get you to the Savior. As we know, faith is a key ingredient to healing (or any other kind of miracle for that matter). For example, one of the best stories of healing is found in the Book of Mormon. All prophets and even Jesus himself stressed that miracles of healing come through faith. But, it is important to remember that failure to be healed is NEVER to be interpreted as a lack of sufficient faith. For example, faithful Job continued to get sicker throughout his trial, regardless of his faith. Now i want to get a bit more practical here. Healing is part of the Atonement. It is part of the promised restoration. As with all things, the Atonement requires faith. It is essentially what we in the legal profession would call an “unsecured promise to pay.” Christ is asking us to trust not only his willingness, but also his capacity and most importantly, that he will in fact fulfill his promise. He asks us to suffer preceived injustices, disabilities, sicknesses, slights, missed opportunities and he simply offers the promise “i will make it up to you…trust me.” Honestly, this is a pretty significant request…he is asking us to trade what feels right now…what we can actually enjoy now in order to receive a promised reward in the future. it is hard to do. Colossally hard. And he asks us to do this…based solely on his reputation. We are required to make our choice without ever meeting him personally, investigating his performance through hard data, or even hearing his voice. All we have to go on is the word of others who have chosen to make the same bargain, plus unconfirmed stories and rumors. If this were a temporal financial investment, it would be colossally foolish. Of course, unlike temporal nonqualified deferred compenasation problems, the “unsecured promise” is actually backed by the might and majesty of an immortal, allmighty god. It is far from a risky investment! But, unless and until you are familiar with that God, the principle of trust is the same. And because of this, we need to be patient with those who struggle with faith. Faith is NOT easy…it is not natural…and it does not make sense. Unless you have a lifetime of practice, faith is extremely difficult. And that is why Jesus, for the working of his miracles and the salvation of our souls, requires not faith the size of a mountain, but rather the size of a mustard seed. He is eternally patient and ready to accept us when we are ready. Do not worry if you don’t believe perfectly now. Simply try your best. Faith to be healed need not be sure knowledge. Looking back at Zeezrom, he had not had time to develop a full, healthy conviction of Christ. He simply believed (or probably more likely, he sincerely wanted to believe) that Alma knew. And that was enough. So coming full circle – we find ourself back to the story that started the discussion. If you cannot come to Christ yourself, find someone who can carry you. Borrow light as long as you need. For faith grows not from wishing and not from blindness, but from experience. Paul called it the “evidence of things not seen.” (Hebrews 11:1). Give yourself time to experience that evidence. If you are trying, it is enough. But surround yourself with those who do have strong faith and allow them to help you come unto Christ. In closing, I would testify to you that Christ can heal anything. His Atonement is promised to be a restoration of all things to their perfect frame. And whether what ails you is a minor complaint or a dread disease, whether it is hurt feelings or darkest depression, there is healing in his arms. One thing to remember, though, is that God’s plans are larger than us. And sometimes the blessing we desire may be denied. Sometimes God requires us to wait patiently and denies us what we think we want. But either way, in Christ is solace and succor. I have seen his healing hand in my life. Fortunately, I have been physically healthy enough. But he has touched my soul on many occasions and taken away my sins. He has saved me from darkness, delivered me from depression, and showed me the way to happiness, peace, and contentment. His invitation calls out: “Return unto me, and repent of your sins, and be converted, that I may heal you?” (3 Nephi 9:13). Take him up on this offer and believe in him as much as you can, and the blessings that result will be beyond measure.